You may change your details at any time by advising us in writing via email. All information we receive from our customers is protected by our secure server. advancedlife’s secure server software encrypts all customer information before it is sent to us. Furthermore, all customer data collected is secured against unauthorised use or access. As the photographic service provider chosen by your school or club, advancedlife photographs all individuals and groups presented to us by the school on the day of photography. The products and services chosen, and the authority to release and use the images taken, is the sole responsibility of the school or club in accordance with their privacy policies. Should you not wish your child to appear in group images or in the photographic packages of their classmates or in any school photographic products, please contact your school and inform them of your choice prior to the day of photography. We may use personal information collected from you for the purpose of providing you with direct marketing material, updates regarding our website and information in the form of a newsletter. However, if you wish to cease receiving any such information you may let us know either by email or unsubscribing at any time and your request will be actioned immediately. We may from time to time need to disclose certain information, which may include your Personal Data, to comply with a legal requirement, such as a law, regulation, court order, subpoena, warrant, in the course of a legal proceeding or in response to a law enforcement agency request. Also, we may use your Personal Data to protect the rights, property or safety of advancedlife, our customers or third parties. We do not and will not sell or deal in personal or customer information. We will never disclose your personal details to a third party except the necessary information required by providers of products or services you have purchased or to protect the rights, property or safety of advancedlife, our customers or third parties or if required by law. Only we will use that information to contact you. However, we may also use in a general sense (without any reference to your name) your information to create marketing statistics, identify user demands and to assist it in meeting customer needs generally. In addition, we may use the information that you provide to improve our website and its services but not for any other use. The information contained in this website is for general information purposes only and is provided by advancedlife Pty Ltd. While we endeavour to keep the information up to date and correct, we make no representations or warranties of any kind, express or implied, about the completeness, accuracy, reliability, suitability or availability with respect to the website or the information, products, services, or related graphics contained on the website for any purpose. Any reliance you place on such information is therefore strictly at your own risk. You need to make your own enquiries to determine if the information or products are appropriate for your intended use. Through this website you may be able to link to other websites which are not under the control of advancedlife. We have no control over the nature, content and availability of those websites. The inclusion of any links does not necessarily imply a recommendation or endorse the views expressed within them. However, advancedlife takes no responsibility for, and will not be liable for, the website being temporarily unavailable due to technical issues beyond our control. This website and its contents are the copyright of advancedlife Pty Ltd © 2015. All rights reserved. By using this website, you signify your acceptance of these terms and conditions of use. For the purposes of these terms and conditions, “Us”, “Our” and “We” refers to advancedlife and “You” and “Your” refers to you, the client, visitor, website user or person using our website. We reserve the right to change, modify, add or remove portions of these terms at any time. Please check these terms regularly prior to using our website to ensure you are aware of any changes. We will endeavour to highlight any significant or substantive changes to you where possible. If you choose to use our website then we will regard that use as conclusive evidence of your agreement and acceptance that these terms govern your and advancedlife’s rights and obligations to each other. It is an essential pre-condition to you using our website that you agree and accept that advancedlife is not legally responsible for any loss or damage you might suffer related to your use of the website, whether from errors or from omissions in our documents or information, any goods or services we may offer or from any other use of the website. Your use of, or reliance on, any information or materials on this website is entirely at your own risk, for which we shall not be liable. For the purposes of Schedule 2 of the Australian Consumer Law, in particular Sections 51 to 53, 64 and 64A of Part 3-2, Division 1, Subdivision A of the Competition and Consumer Act 2010 (Cth), advancedlife’s liability for any breach of a term of this agreement is limited to: the supplying of the goods or services to you again; the replacement of the goods; or the payment of the cost of having the goods or services supplied to you again. Physical goods may be delivered by Australia Post and/or other reputable courier companies. Deliveries are processed promptly upon receipt of full payment. Damaged or lost orders should be resolved with Australia Post or the courier company directly and we are not responsible for goods that are damaged in transit or not received. Replacement of damaged or lost items is made at the discretion of advancedlife. Please be aware there are inherent risks associated with downloading any software and digital goods. Should you have any technical problems downloading any of our goods, please contact us so we may try to assist you. advancedlife handles returns and processes refunds in accordance with the Australian Consumer Protection legislation. 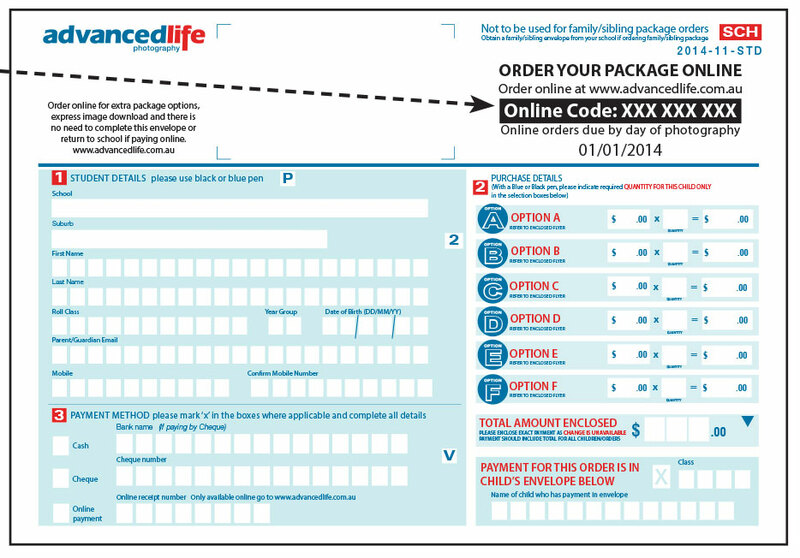 Should you wish to return your photographic order, please return the photographic package in its entirety to your nearest advancedlife office within 7 days of receipt. If we are unable to resolve your complaint or further assist you, we will process a refund upon receipt of the goods purchased. Refunds will be processed promptly and payment made by the same method that you made payment. All refunds and replacements are made at the discretion of advancedlife. No returns, replacements or refunds can be made for personalised gift products ordered through advancedyou. advancedlife takes no responsibility nor will provide a refund if you change your mind about a product you have ordered or if you have made an error when designing your item or used an image that has not reproduced correctly. A preview of your design is provided online to enable you to check your order prior to purchase. If your item is damaged during delivery, please photograph the damaged item and notify us by email within 7 days of receipt. All refunds on items damaged during delivery are made at the discretion of advancedlife. advancedlife may from time to time provide on its website, links to other websites, advertisements and information on those websites for your convenience. This does not necessarily imply sponsorship, endorsement, or approval or arrangement between advancedlife and the owners of those websites. advancedlife takes no responsibility for any of the content found on the linked websites. advancedlife.com.au may contain information or advertisements provided by third parties for which advancedlife accepts no responsibility whatsoever for any information or advice provided to you directly by third parties. We are making a ‘recommendation’ only and are not providing any advice nor do we take any responsibility for any advice received in this regard. To the fullest extent permitted by law, advancedlife absolutely disclaims all warranties, expressed or implied, including, but not limited to, implied warranties of merchantability and fitness for any particular purpose. advancedlife gives no warranty that the documents, goods or services will be free of errors, or that defects will be corrected, or that our website or its server is free of viruses or any other harmful components. It is your sole responsibility and not the responsibility of advancedlife to bear any and all costs of servicing, repairs, or correction. The applicable law in your state or territory may not permit these exclusions, particularly the exclusions of some implied warranties. Some of the above may not apply to you but you must ensure you are aware of any risk you may be taking by using this website or any products or services that may be offered through it. It is your responsibility to do so. You may change your details at any time by advising us in writing via email. All information we receive from our customers is protected by our secure servers. advancedlife’s secure server software encrypts all customer information before it is sent to us. Furthermore, all customer data advancedlife collects is secured against unauthorised use or access. Credit card information is not stored by us on our servers. advancedlife does not and will not sell or deal in personal or customer information. Only we will use that information to contact you. However, we may also use in a general sense (without any reference to your name) your information to create marketing statistics, identify user demands and to assist it in meeting customer needs generally. In addition, we may use the information that you provide to improve our website and its services but not for any other use. advancedlife may be required, in certain circumstances, to disclose information in good faith and where advancedlife is required to do so in the following circumstances: by law or by any court; to enforce the terms of any of our customer agreements; or to protect the rights, property or safety of our customers or third parties. If you are in the business of creating similar documents, goods or services for the purpose of providing them for a fee to users, whether they be business users or domestic users, then you are a competitor of advancedlife. advancedlife expressly excludes and does not permit you to use or access our website, to download any documents or information from this website or obtain any such documents or information through a third party. If you breach this term then advancedlife will hold you fully responsible for any loss that we may sustain and further hold you accountable for all profits that you might make from such unpermitted and improper use. advancedlife reserves the right to exclude and deny any person access to our website, services or information in our sole discretion. advancedlife expressly reserves all copyright and trademark in all documents, information and materials on our website and we reserve the right to take action against you if you breach any of these terms. These terms and conditions represent the whole agreement between you and advancedlife concerning your use and access to advancedlife’s website and your use and access to the documents and information on it. No other term is to be included in this agreement except where it is required to be included by any legislation of the Commonwealth or any State or Territory. All implied terms except those implied by statute and which cannot be expressly excluded are hereby expressly excluded. All images, photographs, graphics, data, including but not limited to moving images, videos and other content (together “Material”) on this website are protected by Australian and international copyright, trademark, patent and other laws relating to intellectual property. You may not do anything which interferes with or breaches those laws or our intellectual property rights in the Material. Any unauthorised use of any Material may violate such laws and we do not grant any express or implied permission to you to use any Material. You may not copy, republish, link to, download, modify, adapt, repost, reverse engineer, create derivative works based on or otherwise use any of the Material on this website without a licence or an agreement from us. Nothing herein grants or can be construed to grant you any rights to use any Material on this website, nor will anything you do transfer any intellectual property rights to you without our express authorisation and permission. This agreement and this website are subject to the laws of NSW and Australia. If there is a dispute between you and advancedlife that results in litigation then you must submit to the jurisdiction of the courts of NSW.